Don’t miss the next free pattern! Sign up for the free Many Small Friends newsletter for subscriber-only bonuses and extra free stuff. No spam, just good dolly stuff. 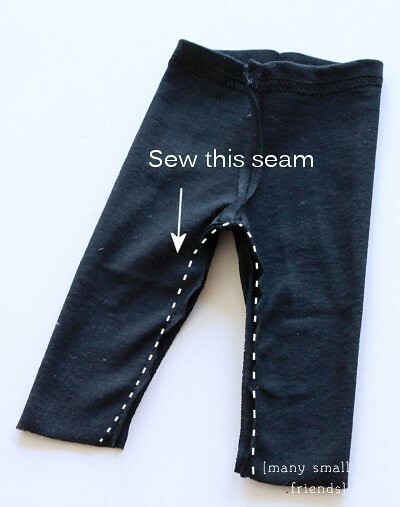 IMPORTANT – Be sure to download and save the patterns to your hard drive and print at “Actual Size” from a PDF reader like Adobe Reader. If you print directly from your browser, the patterns may not print at the correct scale. Have fun making Halloween Costumes for your dolls! Post Pictures on our Facebook Page .. We’d love to see! One last quick note. Black fabrics sometimes contain a lot of dye that can stain your doll. 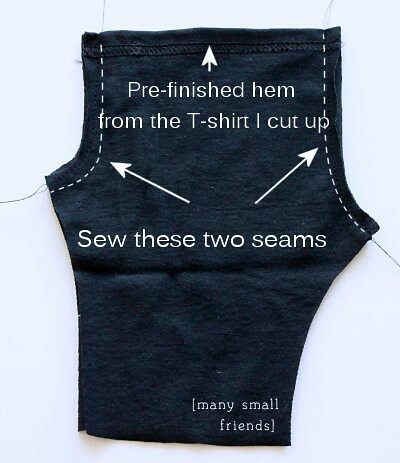 It’s best to pre-wash your fabric or the t-shirt you cut up for this project before you start. And just to be safe, don’t leave your doll in her costume for an extended period of time or in a very hot environment (like a hot car or in a sunny window). She’ll be fine for Trick-or-Treating, but don’t leave her in her costume til the New Year!